The 38th Hong Kong Film Awards took place at the Hong Kong Cultural Centre in Tsim Sha Tsui on Sunday, April 14, 2019. Hosted by 32 newcoming actors, the ceremony celebrated new artists and remembered the old. Anthony Wong (黃秋生) of Still Human <淪落人> beat out Chow Yun-fat (周潤發) for Best Actor, making it his third HKFA Best Actor win and fifth overall. Chloe Maayan (曾美慧孜) of Three Husbands <三夫> won Best Actress, her first HKFA nod and win. 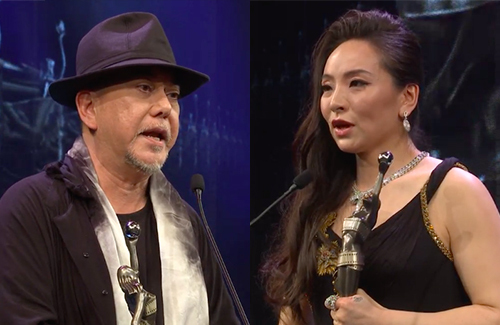 Ben Yuen (袁富華) and Kara Wai (惠英紅) respectively won Best Supporting Actor and Actress for their film Tracey <翠絲>. Chow Yun-fat may have lost the Film King throne, but his film Project Gutenberg <無雙>, which also stars Best Actor nominee Aaron Kwok (郭富城), won Best Picture. Its director Felix Chong (莊文強) won both Best Director and Best Screenplay. Project Gutenberg was the biggest film of the night, winning seven out of 17 nominations. Anthony’s costar in Still Human and Best Actress nominee Crisel Consunji won Best New Performer. The results were predictable this year, both in the major categories and minor ones….it was pretty much the same artists and films who’ve been winning at all the other major award ceremonies. Not a bad thing of course, since all those who won were more than deserving in my book. Congrats to all the winners! The usual crop of actors as always. @jimmyszeto I know, but they’re like on rotation these days. There’s nothing new about them anymore. If I can close my eyes and predict next year’s nominees, it feels like it’s rigged. I know it’s not, but it feels like it! @coralie Not entirely a bad thing. The current HK film industry is not the same as its glorious years. At least HK does have this handful of capable actors. Plus, there will always be a couple of Mainland China or other regions’ actors included in the nomination as well. @1piscesish I think the fact that the industry stagnated so much that I can name next year’s nominees easily with my eyes closed, says something about its future. No new emerging talents and a rotation of old stars (from HK at least.) Even an old rotten ship has a couple of nails and can be useful, but don’t expect any surprises is all I’m saying. @jimmyszeto That’s part of the problem, too. The old ones keep driving movies, but the new ones aren’t given opportunities to. Sure you can say it’s because they’re not good enough, but how can they be good enough without experience and leading opportunities at the same time? How about casting fresh blood, those that just came out from film school or have studied film in college? They allow popular actors to have a chance in film as minor roles, but that doesn’t mean they’re talented. Hollywood does open casting once in a while; whoever has merit wins the role. But I don’t see HK doing that much. @jimmyszeto They’re still just a handful of actors. No new fresh blood and to be honest, none of them were great actors. If HK film industry is really based off merit, do open castings. Give roles to newbies who have no experience, but can act. Give them leading projects. Even in Taiwan, somebody gave a chance to Mark Chao who was a newbie to the industry and though he wasn’t in film (his debut work was TV series Black & White), he won over established veterans like Vic Chou & earned an award. My point being, find new fresh talented blood or else stagnate and die. All those veterans are too old for simple and romantic dramas/movies. They are only good for movies related to police, undercover, triad, revenge, etc. I do think Hong Kong needs to cultivate some new artistes, both male and female, if they want their movie industry to grow and be competitive.